In the fall of 1958, after the death of her husband, Domenica “Minnie" Coccia, along with her daughter Jeannette and son-in-law Joseph Calabria, opened a pizzeria/restaurant at 764 Pittsburgh Avenue in Wooster, Ohio. Opening night yielded a rousing $17.00 in sales. The years have taught us many lessons, some things to try, and some things to never try again! Operated today by Joseph, Jeannette, Karen, and Steve Calabria, the Coccia House features homemade Italian pizza, Abruzzi style. Our dough is prepared fresh daily in our own kitchen and never frozen. Our cheese is provolone made especially for pizza. Our policy is and always has been lots of dough, lots of toppings, lots of cheese. We allow twenty minutes to properly cook our pizza, and a bit more when busy, but feel that “old world” quality and consistency is a better bargain than “new age” speed at all costs. Of course, we offer a full menu of Italian and American dinners and specials. Our homemade pastas are truly homemade, as are the bread, meatballs, and sauces. A full service bar is at your disposal. The Coccia House stands for quality, consistency, and service. We are an independent family owned restaurant proudly catering to the families of our community. We believe that dealing with customers as people in a friendly atmosphere, like family, makes our area a great place to live–and dine! 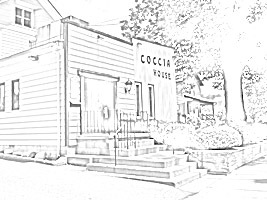 ...from the Calabrias and our extended family, the entire staff of Coccia House.